This is the old entry page for Algae World and gives access to all of the material added to the site before 2007, together with most newer material. However, as the site is expanded, some material will be accessible only from the new entry page. In effect, the Algae World website has an archaeology, different layers having different content and different styles. The site is developed without professional assistance and we do not have time or skills, or even the inclination, to impose a uniform appearance to the whole site. The links down the left-hand side provide navigation, in both the older and newer sections. Anyone remembering the site pre-August 2007 will recognize the style of the older parts, although we have reformatted all pages to avoid frames and most tables have been removed.The site is developed as and when we have time. Months will go by without changes, except to our lists of publications, which are generally up-to-date. Then there may be a burst of activity, adding new material. Please return from time to time, to check what is available. 'people' and 'publications' are self-explanatory. Under 'research', you will find a brief overview of our research aims and information relating to some of our previous research, including links to images and data, and photomicrographs of the type specimens of species we have published, presented as 'focusable' stacks of images. We have also included collections of pictures used in some of our morphometric papers and the accompanying data sets. 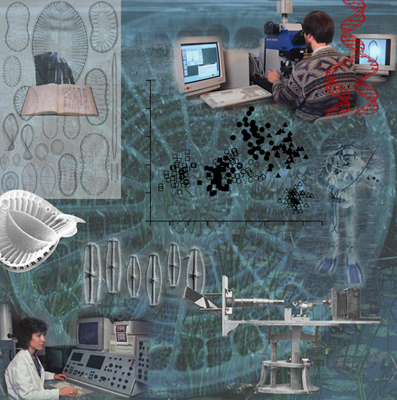 On the 'projects' page, you will find links to websites describing the ADIAC, DIADIST and EDDI initiatives, which developed databases of images and (ADIAC and DIADIST) methods for automated identification of diatoms. There is also a link to pages describing a multi-access key we helped develop to aid identification of river diatoms in the UK. Under 'methods', we provide information about microscopy, sampling and sample preparation, etc. The 'algae', diatoms' and 'Sellaphora' pages are under development. Sellaphora is our model system for studying speciation and biogeography in diatoms and most of our Web effort in 2007 and 2008 will go into developing pages describing this system and the sexuality of diatoms (under 'auxospores'). 'art' gives a brief introduction to art works relating to algae, produced by David Mann; this is not a commercial site. Finally, we provide links to other websites dealing with algae. Last update was 20 November 2007.